For an additional charge of £95 guests can experience a RUSTIC ROMANCE package to ensure they won’t forget their bucolic trip to sunny Somerset. More than a tumble in the hayloft, the Rustic Romance package starts the moment you arrive – and includes chilled champagne, roses, an exotic fruit basket, celebration balloons and divine chocolates. 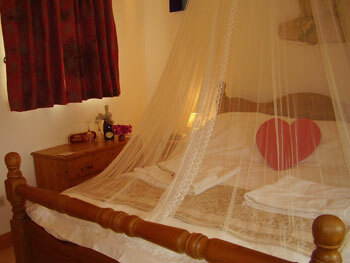 Romantic touches to the bedroom will be discovered as they open the door to a weekend to remember. Delight in a twilight swim in the mineral waters of the rooftop pool overlooking Bath at the Thermae Spa. Do it in wellies! – get down and dirty in the milking parlour with Tom and his ‘girls’. Let us know if you have a special request you would like to organise for your loved one and if possible we will try to help you arrange it. All additional treats booked on your behalf are subject to an extra charge and availability at the time of booking. Please give as much notice as possible to ensure we are able to book your chosen package. The above extras are only available in addition to the Rustic Romance package and cannot be booked on their own.